How much deicing salt does America go through every year? A Purdue study showed property owners in the U.S. apply more than 15 million tons of deicing salts to their driveways, patios, and walkways, and that’s not including salt applied to roadways. Salt comes in a variety of forms. Most deicing salts are identical to the table salt in our spice rack, sodium chloride. In its raw mineral form, sodium chloride is referred to as halite, better known as rock salt. Deicing salts can have a negative effect on plants. Humans have known about the toxic effects of salt on plants for centuries. In fact, salt is thought to be the first biological weapon; ancient invading armies used salt to destroy enemy crops. “Excess salt works two ways against plants,” Enroth said. “The first occurs in the soil when the sodium and chloride ions separate after dissolving in water. The sodium ions block the plant root’s uptake of other critical plant nutrients like potassium, calcium, and magnesium. Then the plants absorb the chloride, which interferes with photosynthesis. What can you do to protect landscape plants and lawns? Hose off road salts that splash onto trees and shrubs as soon as possible or cover with burlap as a barrier to salt spray. 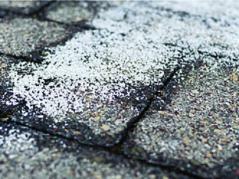 Avoid planting in areas that will inevitably get treated with deicing salts. Salt can build up to lethal levels in the soil. As the weather warms, you can leach salts out of the soil by irrigating the area multiple times with deep waterings. Apply deicers before a storm arrives. You will also end up using less deicing material with this approach. If snow and ice are already covering your walkway, shovel and remove as much frozen stuff as possible before applying the deicer.